The three boys thoroughly enjoyed singing the song and their enjoyment is quite evident in the vocals and their eyes which make it a blissful watch. This year marked 15 years of the movie Kal Ho Naa Ho but the Shah Rukh Khan mania has plagued longer and wider which is proved by the video of Nigerian boys singing the title track of the 2003 release, KHNK. Their soulful voice has casted a magic as the video is currently trending across the internet and on Twitter alone has been retweeted more than 10,000 times. 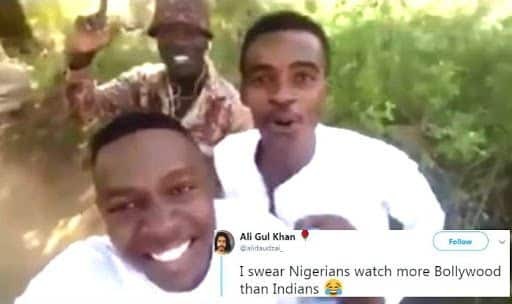 In the video posted on Twitter by one Ali Gul Khan from Australia, three Nigerian boys are seen flawlessly singing the song while one of them also raps in between the rendition. We have always believed that love for Bollywood unites people across the world. The same has come true as fans as tweeting their awestruck reaction on seeing the video. The original soundtrack was composed by Shankar–Ehsaan–Loy and sung by Sonu Nigam while the lyrics were penned down by Javed Akhtar. The movie, co-produced by filmmaker Karan Johar and his father Yash Johar, under their Dharma Productions banner featured Jaya Bachchan, Shah Rukh Khan, Saif Ali Khan, and Preity Zinta as the lead characters, with Sushma Seth, Reema Lagoo, Lilette Dubey, and Delnaaz Paul in supporting roles. Nikkhil Advani directed the romantic drama.